Looking for more than just a cup of coffee to perk you up on a weekend or after a tiring day at work? Why not get your best buddies and put your heads together over some board games? Or, perhaps, lose yourself in a book with some food and drinks for company. With several cafes in the city serving more than just great food, we picked out the ones which offer you a spot of board games and a choice of books. Thank us later! If it’s board games you’re looking for, then Dice n Dine is where you should head to. With a collection of over 400 games (yes, you read it right), we bet they can keep you engaged for an entire weekend! Stocking everything from classics like Scrabble and Pictionary to European games like The Settlers of Catan, Puerto Rico and Ticket to Ride, they even let you buy some of them. You will be charged a nominal amount (INR 60-100) for an hour of playing, which can be redeemed on food. Head here on a Tuesday evening for their regular sessions of Bangalore Board and Card Gamers. Heading here with your friends? Order yourselves cups of coffee and settle down for games of Snakes & Ladders, Chinese Checkers, Chess or Uno. You could also pick up a book (they have comics as well as food and travel books) and enjoy a lazy day, tucking into their All-Day Breakfast and poring over a tome. Always went to Cafe Thulp for their amazing burgers? Well, next time you go, make sure you check out their selection of games, magazines and novels. Whether it’s to celebrate the joy of having won or as comfort food to get over your loss, doesn’t a hamburger taste so much better after a round of Pictionary or Chess? They also have comic books for kids, just in case the food doesn’t manage to hold their attention. Find a Cafe Thulp near you here. While Chavadi does not have board games, they do have something innovative to entertain you. Make way to their Story Wall (blackboards, basically) where the owners start a story thread and you get to take it forward. So, by the end of your meal here, you can expect to see an interesting tale, with inputs from different customers. They also have a well-stocked library, so you can sit back with your favourite novel (you can even buy it), a mug of beer and make most of the rooftop ambience. A meal here will invariably include a game, we assure you. The tabletops at this newly opened cafe come inscribed (using laser engraving or 3D printing) with familiar games, but with a ‘foodie twist’. We think that’s enough to tempt you to try your hand at their version of Snakes & Ladders which has healthy food to take you up the steps and junk food to pull you down. 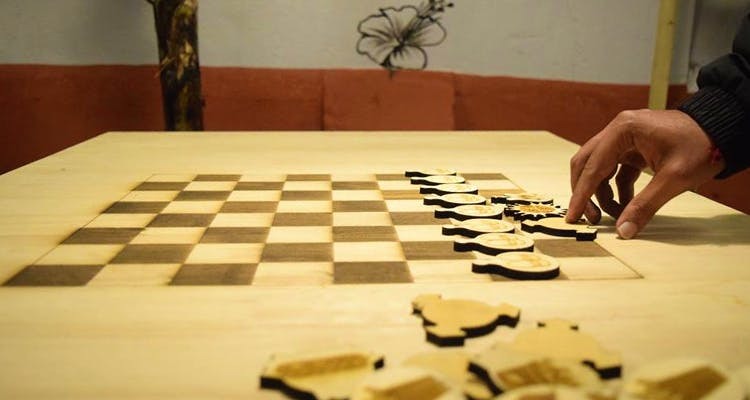 And, before you know, you will also be trying your hand at their variation of Tic Tac Toe (with coffee beans and cups) as well as chess which has pieces with images of french fries, pizzas, burgers and hot dogs. This one’s for the comic book enthusiasts. From superhero comics to good old Tinkle, you will be spoilt for choice. Alas, no board games here. But, we think the great food (their breakfasts come highly recommended) and the selection of comics more than make up for that.